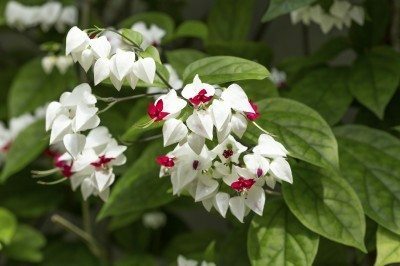 Also known as glorybower or tropical bleeding heart, Clerodendrum bleeding heart (Clerodendrum thomsoniae) is a sub-tropical vine that wraps its tendrils around a trellis or other support. Gardeners appreciate the plant for its shiny green foliage and dazzling crimson and white blooms. Clerodendrum bleeding heart is native to western Africa. 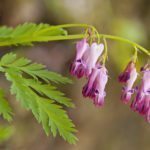 It is not related to the Dicentra bleeding heart, a perennial with dainty pink or lavender and white blooms. Although some types of Clerodendrum are extremely invasive, Clerodendrum bleeding heart is a well-behaved, non-aggressive plant that reaches lengths of about 15 feet at maturity. You can train Clerodendrum bleeding heart vines to twine around a trellis or other support, or you can let the vines sprawl freely over the ground. Clerodendrum bleeding heart is suitable for growing in USDA zones 9 and above and is damaged in temperatures below 45 degrees F (7 C). However, it often regrows from the roots in spring. In cooler climates, it is commonly grown as a houseplant. Clerodendrum bleeding heart performs best in partial shade or dappled sunlight, but it may tolerate full sunlight with plenty of moisture. The plant prefers rich, fertile, well-drained soil. Water the plant frequently during dry weather; the plant requires consistently moist, but not soggy soil. Clerodendrum bleeding heart needs frequent fertilization to supply nutrients required to produce blooms. 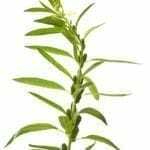 Feed the plant a slow-release fertilizer every two months during the blooming season, or use a water-soluble fertilizer every month. Although Clerodendrum bleeding heart is relatively pest-resistant, it is susceptible to damage by mealybugs and spider mites. Insecticidal soap spray is generally sufficient to keep the pests in check. Reapply the spray every seven to 10 days, or until the insects are eliminated. Prune Clerodendrum bleeding heart vine by removing wayward growth and winter damage before new growth appears in spring. 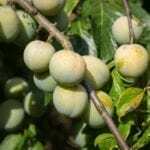 Otherwise, you can trim the plant lightly as needed throughout the growing season. 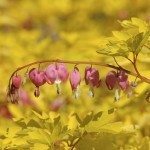 Read more articles about Bleeding Heart Vine.